on Saturday night from the opening (4 pm) until maybe 9 pm, where some metal clay guild-mates (Alice, Debbie, and Donna) and I will be doing demos; this is my fifth year in that role (my, how time flies! ); plus, I will also try to scout out sites so I can go back…. on Sunday around midday, when I’d like to try to take some GigaPan images, mostly because I want to try a couple things in order to learn some more about the quirks of that process (both taking the shots and “stitching” them together), but also because it seems like it should be fun to try to capture a hint of the magnitude of this event. If you can make it, I’ll sure look forward to seeing you there! This entry was posted on 2012/04/23 at 22:00	and is filed under Events, Guild. 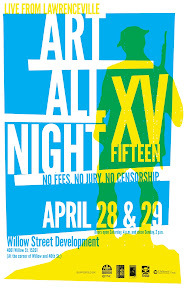 Tagged: ArtAllNight. You can follow any responses to this entry through the RSS 2.0 feed. You can leave a response, or trackback from your own site.